Lithium sulphur batteries have been touted for many years as a potential replacement for lithium ion technology, because the chemistry of the lithium sulphur system would allow more energy to be stored in a single battery. However, the same chemistry is also proved a stumbling block, as the sulphur tends to migrate away from the electrode by forming complex polysulphide compounds. This results in the superior energy density degrading after first few recharge cycles. The challenge for researchers has been to find a way to stabilise the Li-S electrode without either adding weight to the battery or making it too complex to manufacture. Researchers from Drexel University College of Engineering in Philadelphia are now claiming a breakthrough that could result in a battery with a capacity four times higher than similarly sized lithium ion unit. Developed in the laboratory run by Vibha Kalra, the breakthrough comes in the form of a porous titanium monooxide nanofibre mat, somewhat resembling a bird’s nest. This forms part of the cathode of the battery. 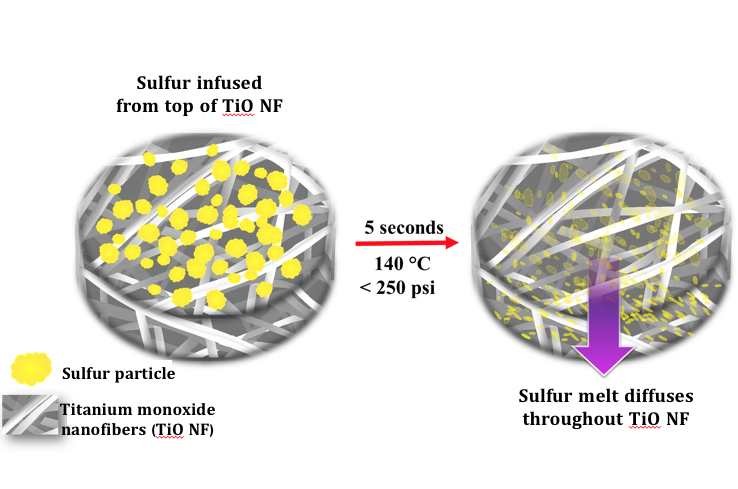 “This is a significant development because we have found that our titanium monoxide-sulphur cathode is both highly conductive and able to bind polysulphides via strong chemical interactions, which means it can augment the battery’s specific capacity while preserving its impressive performance through hundreds of cycles,” Kalra said. Described in the American chemical Society journal Applied Materials and Interfaces, the nanofibre mat attracts and binds polysulphides as they are formed, preventing them from dissolving in the battery electrolyte. Kalra came to the realisation that this might be an effective solution by studying the mechanism of the formation of the polysulphides and reasoning that, as the sulphides act as a “Lewis base” – a material that can donate a stabilised pair of electrons in a solution – including a stable electron pair accepting Lewis acid into the system would theoretically bind the sulphides in place. Kalra has previously proved that nanofibre electrodes are a good option for batteries, as they can expand while charging and can eliminate flammable components from devices. They are made by an electro spinning process which resembles making candy floss, and do not require insulating and binding ingredients which are needed by powder-based electrodes. “We can also demonstrate the complete elimination of binders and current collector on the cathode side that account for 30-50 per cent of the electrode weight — and our method takes just seconds to create the sulphur cathode, when the current standard can take nearly half a day,” Kalra claimed. Kalra’s team believes that the new batteries might be suitable for applications including electric vehicles and grid-level electricity storage. They are now working to further improve cycle life and reduce the formation of polysulphides overall.